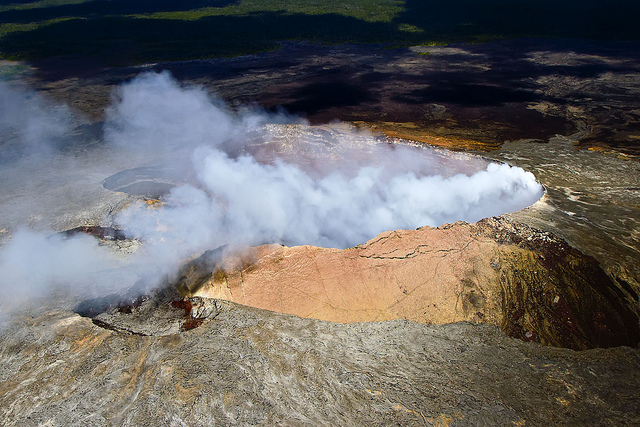 Fly from Kona to see exciting volcanic activity at Kilauea Volcano in Hawaii Volcanoes National Park. The Big Island is gorgeous and well . . . big! 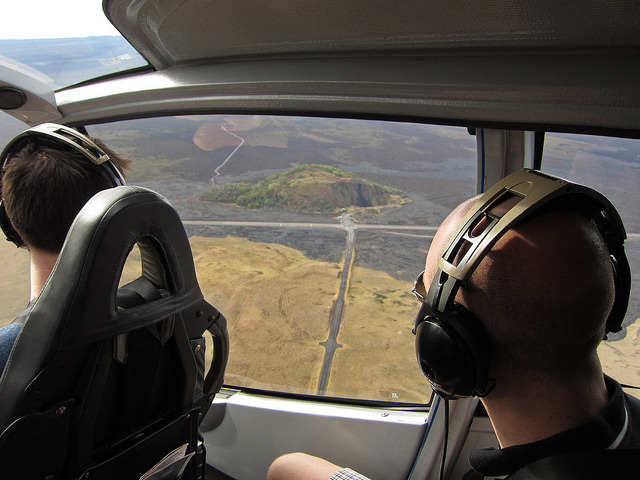 This helicopter tour is the ideal way to see both her beauty and her volcanic fury. 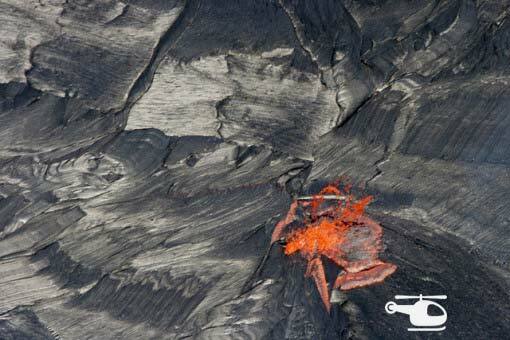 Tour black sand beaches and lava flows as you approach Kilauea, the world’s most active volcano. 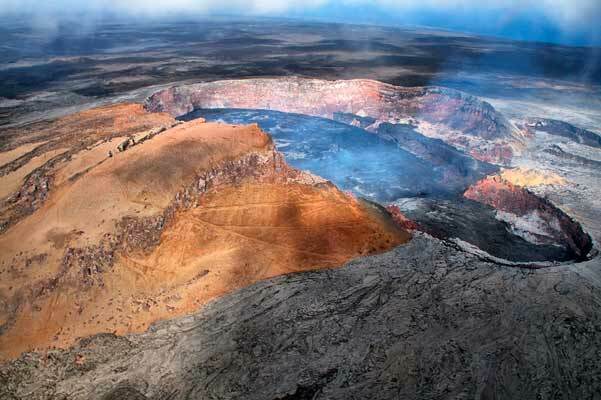 It has been erupting since 1983 and continues to provide a show for helicopter passengers. The helicopter pilots communicate with each other to share information about the best viewing locations each day. 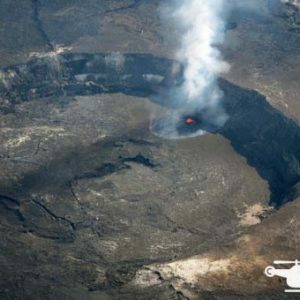 Volcanic activity varies, but you will have the best chance of seeing it from a helicopter. 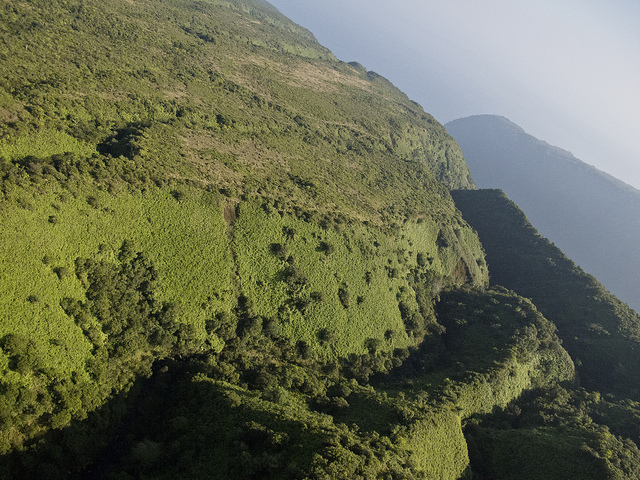 After departing the volcano, you will fly over macadamia nut orchards and coffee plantations. Just when you thought the volcano was the highlight of the tour, you arrive at the Hamakua Coast. With lush rain forests and gorgeous sea cliffs, this coastline is not to be missed. 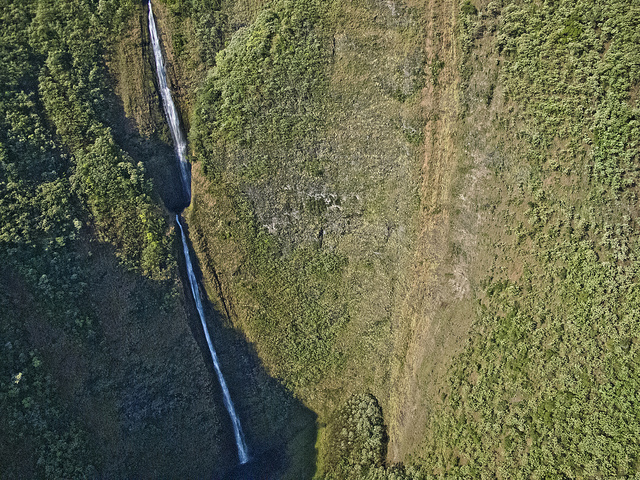 The Hamakua coast has massive waterfalls that drop into the ocean from cliffs over 1000 feet (300m) high. 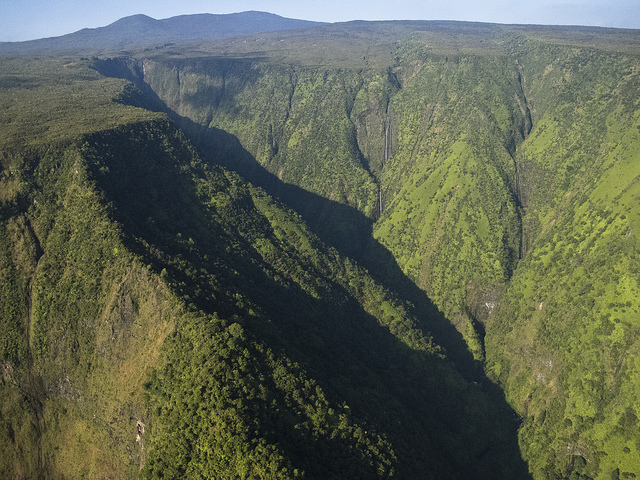 You will see ancient Hawaiian settlements in a view only possible from a helicopter. 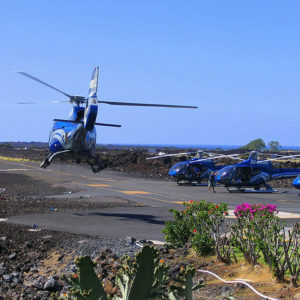 The helicopter tour from Waikoloa has an option to stop at a waterfall. We highly recommend choosing this option because it is an exclusive landing with 20-25 minutes on the ground. 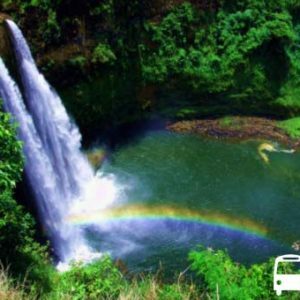 You will get photos of the magnificent Punalu’u waterfall that are one-of-a-kind. It makes this exceptional tour even more spectacular. We got to see some lava in the top of the volcano and some flows down below, as well as some forest fires, and flew also out over the ocean. It was all so stunningly beautiful and breathtaking. Having the birds eye view was really neat. Our helicopter had a glass bottom, so we could view from more angles . 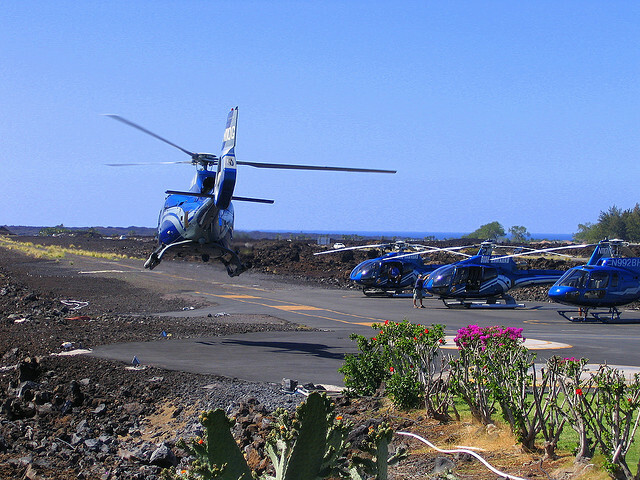 Blue Hawaiian Helicopters has a high safety record and a professional flight crew. Well they don’t lie there is not a bad seat in the chopper but on a relative basis the 2 middle back seats have a lesser view. My wife saw a lot with the window seats especially when the pilot rolls to that side. Over all it was a Wonderful experience taking this tour. Our pilot was awesome and that’s very important. What an incredible experience we had today! Our pilot was a super nice young woman (hate that I forgot her name); so friendly and informative as we flew around Hilo and to the volcano. It was a tad awkward having to be weighed before the flight to make sure everything balanced out. We flew over molten lava, waterfalls , and circled the island. This was my first helicopter ride since childhood. Wow! Never thought I’d get to do something like this. 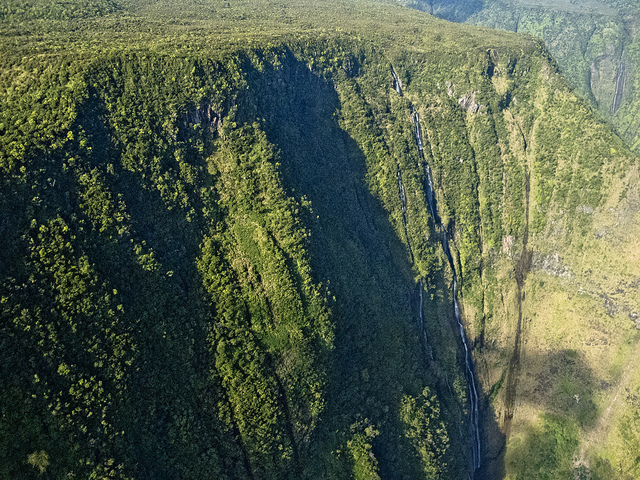 In a helicopter over an active volcano, getting a bird’s eye view of the majestic Hamakua coast with waterfalls dropping a 1,000 ft! 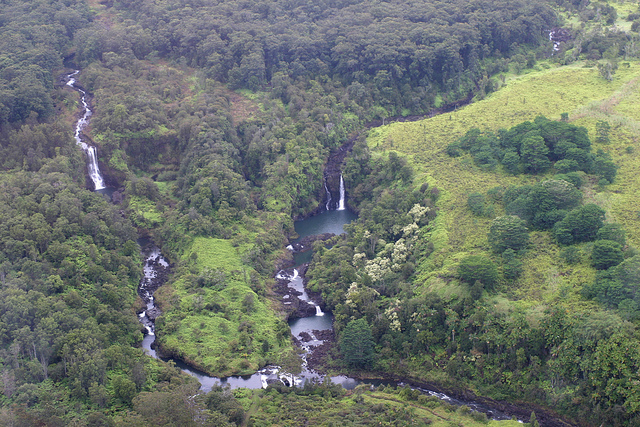 Then to top it off we chose the landing at Punaluu Falls…. Now this is the way to vacation. My wife was a little scared, but during the flight she was like, “THIS IS AMAZING”! lol I recommend this to anyone. So cool! Blue Hawaiin is a phenominal way to understand new things about your connection to the world when flying over a geological wonder. Seeing lava flow into the sea was epic and humbling and it’s difficult to articulate….the earth being formed. The pilot Marco was fun and answered all our questions. We were able to see lava burning trees, it was great! Waterfalls, waterfalls, waterfalls!!!! We were a bit nervous about a helicopter ride, but the staff was very professional. Although we are a couple, we saw families, children, teens, and seniors enjoying the ride!! Highly recommended for everyone. We have done a lot of excursion and site seeings- and this by far was one of the very best we have ever done! Our pilot Shane- was great and it was a terrific experience. Would have been disappointed if we missed out on it! tour itself was just amazing. Actually, the helicopter tour we took back in ’91 was better than this one that was taken in 2015–it was foggy and a little rainy, and there wasn’t much lava to be seen at Kilauea. Over all it still made for a fun vacation. I give it a 4 solid stars. on seeing the island this way, well worth the cost. This was the single best thing we did during our ten day visit to the Big Island and Maui. from the minute we arrived until we left, the professional staff made us comfortable and excited for the experience. Saw breathtaking waterfalls and the coast line that you can’t see except from the air. Expensive, yes… but a once in a lifetime experience! My first helicopter ride ever. Felt like royalty. haha. The views of waterfalls, moutainsides, and lava doesn’t get any better than this. Spend the money and take the all inclusive experience with a waterfall landing. 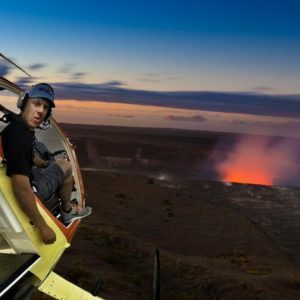 Flying over red hot lava and landing the helicopter in the spray of a waterfall on the same trip is something I can’t imagine I could find anywhere else. Shane was our pilot – knowledgeable, friendly, professional. The music adds to the dramatic views – a very neat experience. We and our teenage sons were blown away by our Big Island Spectacular tour! Our pilot, John, was a wonderful tour guide-very knowledgeable about the island and a great sense of humor. The visibility was excellent even from the middle back seats (where I was), and the ride was generally smooth. Not having been in a helicopter before, I was pleasantly surprised by that. Dale our pilot took us on our flight. He choose incredible music to make our flight even more amazing and memorable than it could have been. 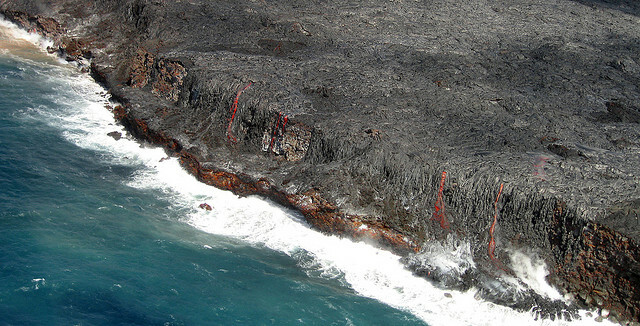 You may only see a few lava breakthroughs and not flowing red lava, and it is no longer flowing into the ocean. Regardless, the views are impressive. sure that people got a good view from every seat. We booked our tour over the volcanoes, but on the day we had to return due to unclear visibility, and therefore unsafe conditions. However, the staff booked us in for a flight the next day, and the weather was perfect. The prices may “give you pause”, but the views will “stop you in your tracks”!!! Don’t miss this magnificent way to see Hawaii!!!! ​​Lava flowing is an act of nature, therefore we do not guarantee sighting of lava. 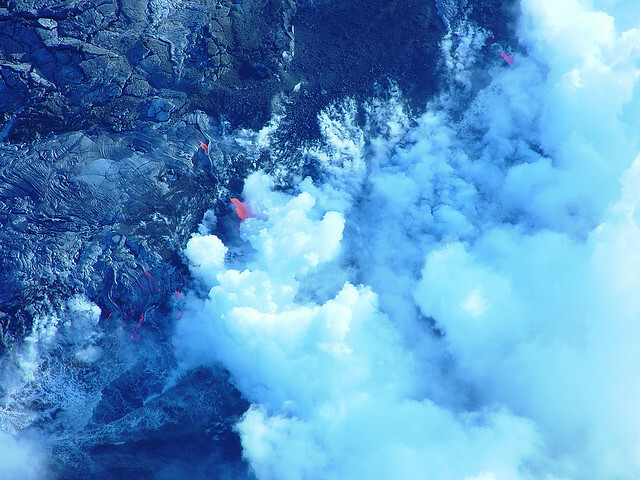 Surface lava flows may be present but may not be visible due to environmental conditions or time constraints. The Federal Aviation Administration requires that each passenger is weighed prior to departure. This weigh-in process is very discreet when you check in. For critical flight planning purposes we need to have the body weight of each passenger included in your order. Please be as accurate as possible when providing weight information. Any significant variance in the weights provided and actual scale weight could result in flight delays or possible cancellation. For each guest weighing more than 260 pounds on Eco-Star flights or more than 250 pounds on A-Star flights, an adjacent, empty seat purchase is required. The charge for an adjacent empty seat is 50% off of the regular tour price. This open seat ensures the comfort for you and all of our guests on your flight. Please inquire directly with our reservations staff by telephone about the possibility of a comfort seat waiver. This flight and the facilities are wheelchair accessible. The flight might not operate if fewer than 4 participants are booked. The activity schedule is subject to change. The activity is subject to cancellation due to weather. 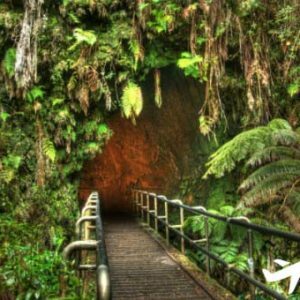 Transportation to/from Hilo International Airport. Tour guide/pilot gratuity is not required, but encouraged. Volcanic activity occasionally causes closures and detours that affect tour routes and sites. As a result, itineraries and stops are subject to change without notice at any time due to the continued volcanic activity as our guests’ safety is our top priority. Payment is required at the time of reservation. When we receive your reservation, we will confirm and email you a voucher with your activity details. If we are unable to confirm your reservation, your credit card will be refunded. Cancellation policies are specific to the tour that you book. Please look at the cancellations tab for information.